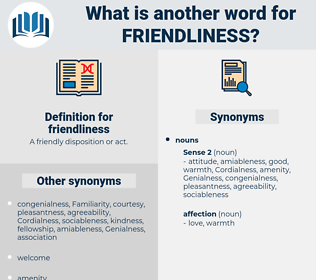 What is another word for friendliness? A friendly disposition or act. usability, fraternity, usefulness, affection, respect, good-will. kindness, friendship, cordiality, warmth, conviviality, goodwill, courtesy, benevolence, sympathy, friendly, liking, gentleness. coldness, aloofness, incompatibility, hostility, hatred. intolerance, querulousness, disfavor, venom, enmity, belligerency, hate.
" You must come again," said Mrs. Purnell, in a spirit of friendliness. The universal courtesy and friendliness of manner have a very different seeming from the politeness of the French. closeness, good-neighbourliness, good-neighborliness, affability, congeniality, neighborliness, hospitableness, cordiality, bonhomie, amiability, accessibility, geniality, helpfulness, intimacy, affableness, amicability, amiableness, kindliness, neighbourliness, approachability, amicableness, Familiarity, amity. amicableness, amicability, goodwill, good will, brotherhood.